Now that the Crew Bunk Rooms were finished I could move on to the rest of the crew quarters. I ended up creating just three types of State Rooms: One for the most senior officers (8), one for officers (8) and the last one for general crew members of the ship (64). I did one thing to the Mess Hall and the Galley that I had forgotten to do before starting on the rooms. After finishing the Mess Hall and the Galley I started working on the Crew Bunk Rooms. These rooms are intended for the flight and engineering crew but not for other personnel and senior officers who will have state rooms. There are four of these rooms for housing 48 crewmembers. The layout of the rooms had already been established and the design for the bunk pods was already done but now was time to put the rest of the design together. Halfway through working on the Mess Hall and Galley for my starship, I was given the opportunity to work with the Pro version of SketchUp for a period of time so I decided to spend it creating dynamic components for my starship project. Since the last update I wrote I have been able to finish the Mess Hall and the Galley as well as finish the design of the Crew Bunk Rooms. I will save the Crew Bunk Rooms for the next update and focus on the Mess Hall and Galley this time. I would have finished this a lot sooner except I took a detour which I will explain later. Just like last time, I moved on to the next part of the ship without first writing about what I had just finished. Anyway, this post is about the Medbay. I had done some preliminary work in the Medbay back when I was calling it the infirmary but I left it a blank room with just the bacta tanks borrowed from the last ship I made. 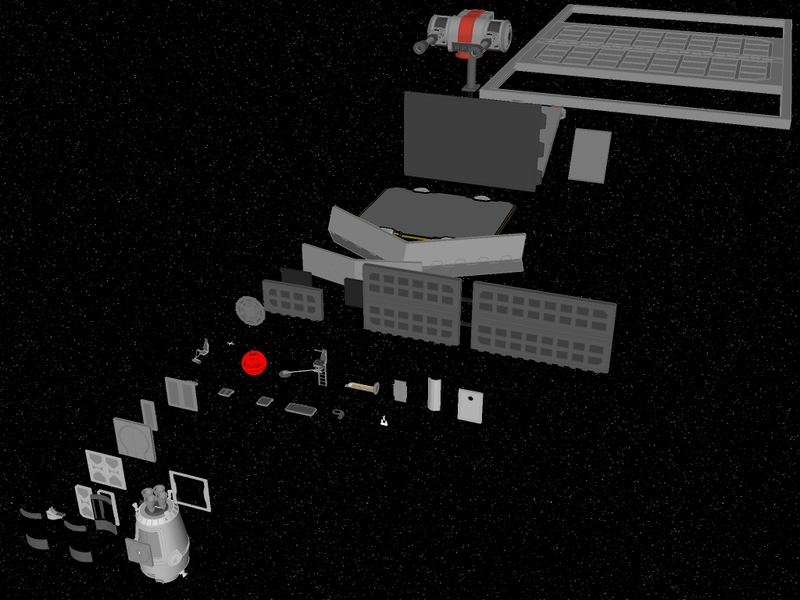 This post covers the final work done on the Briefing Room. I have since finished the Medbay (formerly the Infirmary) and I will cover that in the next update. This was a rather simple room to finish because all it was missing were the railing on the upper level, a large tactical holoprolector, seating for the lower level and the ceiling design for the room. In the last update I wrote I said I would be working on the interior of the ship so that’s what I have been doing. I started by finishing off all of the corridors by designing the floors and ceilings and adding materials to the walls. That part of it was very monotonous and took some time but it was pretty easy. The last thing I did was to create the interior space for the Heavy Turbolaser Turret in the middle of the hull. Since my last update I have focused on adding details to the exterior of the ship. Some of the details added are just cosmetic but others are essential to the operation of the vessel. Since the last update, I decided it was time to work on the Observation Deck which has been left neglected for far too long. At the time of this writing I have decided to rename the Observation Deck to the Tactical Bridge to better suit its purpose.